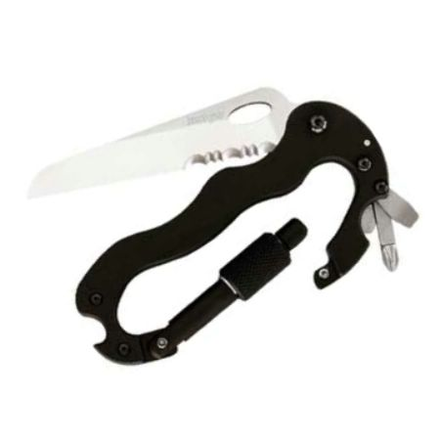 Kershaw’s patented, five-in-one Carabiner Tool features a versatile knife blade in AUS6A stainless steel with partial serration. It’s designed to handle a wide variety of cutting tasks. There’s also a flat-head screwdriver, Phillips-head screwdriver, bottle opener and carabiner clip. The carabiner attaches the tool to vest, backpack, or belt loop with ease so it’s always handy when you need it. The handle is lightweight aluminum with durable Teflon coating in your choice of four colors.